In its report, the Stockholm International Peace Research Institute (SIPRI) disclosed on 18, this year that an estimated 110-130 Indian nuclear bombs are stored in six or so government-run sites across India. Within the next five years to one decade, as many as 60 reactors will also be functional in India with the active cooperation of the US-led western and far eastern allies. In the past, several incidents of leakage and theft in addition to alarming episodes of lax security on existing nuclear sites given a history of civil tumult have occurred in India. India is notorious for highly lax security of its nuclear facilities. The episode of 8 October 2014 at Kalpakkam, when a soldier of Central Industrial Security Force (CISF) responsible for protecting nuclear materials, went on a rampage to destroy the security of the facility leading to nuclear material theft by criminals. Many incidents in the past including theft and leakage incidents of 2003, 2008, 2009 and 2013 are alarming examples of what inside and outside officials depict as serious short-comings in India’s nuclear safeguards. India and Japan have a terrible record of nuclear reactor leakage due to various reasons which consequently proved disastrous. But, Indian poor nuclear security has broken all the records. Indian media reported on July 5, this year that the Kolkata police have arrested five men with 1 kg of uranium valued at around Rs. 3 crores ($440,000). The Times of India elaborated that the men had come to Kolkata in the state of West Bengal to try to sell the substance. Police was quoted as saying that two packets of a “yellow-coloured substance” were seized. Similarly, by pursuing the double standards of America and some Western countries in its worst form, President Trump also favoured India, while opposing the nuclear weapons of Pakistan. Because, being the only nuclear country in the Islamic World, Pakistan annoys the US, Israel and some Western countries. It is Zionist agenda to ‘denculearise’ Pakistan. However, like Obama, Trump has brushed aside the ground realities that Indian Prime Minister Narendra Modi led by the ruling fundamentalist party BJP has been implementing anti-Muslim and anti-Pakistan agenda. As part of their double game, these US-led countries have ignored poor Indian record of nuclear security, non-proliferation, lack of safety of workers, working at Indian nuclear facilities and lack of any appropriate regulatory authority. Indian record proves various kinds of security and safety lapses regarding various nuclear plants and the related sensitive materials, including events of leakage, nuclear theft, smuggling and killing. In this regard, in November 2009, more than 90 Indian workers suffered radiation due to contamination of drinking water at the Kaiga Atomic Power Station in Karnataka. On July 27, 1991, a similar event occurred at the heavy water plant run by the Department of Atomic Energy at Rawatbhata in Rajasthan. Nuclear radiation had affected and injured many labourers there. In July 1998, India’s Central Bureau of Investigation (CBI) seized eight Kg. of nuclear material from three engineers in Chennai, which was stolen from an atomic research centre. On January 26, 2003, CNN pointed out that Indian company, NEC Engineers Private Ltd. shipped ten consignments to Iraq, containing highly sensitive equipment entailing titanium vessels and centrifugal pumps. In June 2009, India’s nuclear scientist, Lokanathan Mahalingam missed from the scenario and after a couple of days; his dead body was recovered from the Kali River. Indian police concocted a story that Mahalingam had committed suicide by jumping into the river. It is a big joke to hide some real facts behind his death because wisdom proves that if an educated person decides to commit suicide, he will adopt a soft way to eliminate his life. Afterwards, Dr Haleema Saadia said that the death of the scientist was a conspiracy. Nevertheless, such events in connection with nuclear material continued unabated in India, putting the security of atomic weapons and their related components, including the lives of workers at high risk. It is mentionable that during his first visit to New Delhi, on November 6, 2010. President Obama announced the measures, America would take regarding removal of Indian space and defence companies from a restricted “entities list”, and supported Indian demand membership of four critical global nuclear nonproliferation regimes. President Barack Obama’s visit to India, on January 25, 2016, the US and India announced a breakthrough on the pact which would allow American companies to supply New Delhi with civilian nuclear technology. Notably, America is a potential military supplier to India. The US also pressurised IAEA and the Nuclear Suppliers Group (NSG) to grant a waiver to New Delhi for obtaining civil nuclear trade on a larger scale. Evidence indicates that India has not fulfilled the conditions of the NSG waiver. At least, eight of India’s nuclear reactors are outside safeguards which are a big question mark on the credibility of its nuclear safety and security standards. Two reports from the King’s College–respectively titled ‘India’s Nuclear Exceptionalism’ and ‘India’s Strategic Nuclear and Missile Programs’ also claim that India has already accumulated nuclear material for over 2600 nuclear weapons, including all of its unsafeguarded reactor-grade plutonium, which is weapon-usable, and raised concerns over this stockpiling. 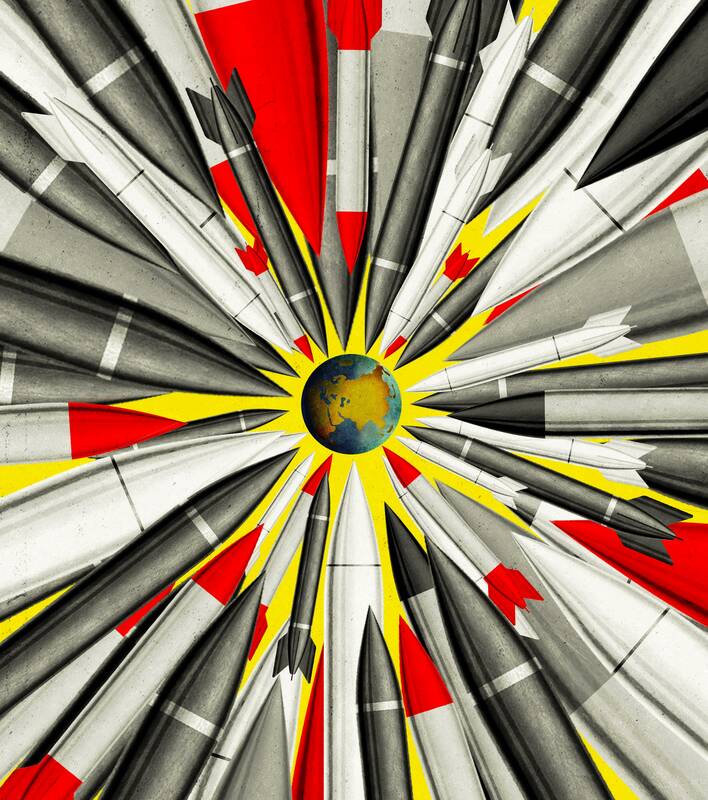 In fact, in the pretext of countering China, Washington has continued favouring India’s programme of advancement and modernisation of nuclear weapons. The US supports the Indian nuclear programme in the guise of anti-China and anti-Pakistan approach. Beijing is apprehensive about the emerging threat, as, during the last visit of Obama to New Delhi, the intent of President Obama and Indian Prime Minister Modi was quite clear while mentioning about free sea lanes and air passages in the South China Sea. President Trump is also pursuing the policy of his predecessor in this respect, as in the recent past, during his meeting with Prime Minister Modi, he showed a similar approach. Nonetheless, arms deals with America, which also include nuclear submarines to New Delhi, would increase Indian hegemonic designs in the region. And NSG’s membership in India will create concerns for regional strategic stability. Although these atomic weapons seem to be mysterious, yet still could be within reach of some Hindu terrorists with the help of RAW which might have also got these destructive arms from Mossad. Such atomic weapons or radiological materials could have also been smuggled inside India by the Hindu fundamentalists with the covert assistance of RAW. Frustrated in isolating Islamabad, RAW in connivance with Mossad might have prepared a most dangerous plan to use nuclear weapons or dirty nuclear bombs inside the US homeland or any major European country to implicate Pakistan for having allegedly used these weapons through some Taliban militants. Mainly, RAW and Mossad may also employ these lethal weapons against NATO forces in Afghanistan, as India and Israel want to prolong the stay of the US-led NATO troops in Afghanistan which have become the centre of their covert activities against Pakistan, Russia, China and Iran. RAW and Mossad may use terrorists of the Islamic State outfit (Also known as Daesh, ISIS and ISIL) which are strategic assets of the CIA for employment of these unconventional weapons. While, India, Israel and America are also playing double game against one another, hence, by utilizing the vicious circle of terrorism, New Delhi can alone use these weapons through Afghanistan-based Tehreek-e-Taliban Pakistan (TTP) and ISIS which are also being backed by RAW, CIA and Mossad, and have claimed responsibility for several terror assaults inside Pakistan and Afghanistan, including the recent ones. So, RAW’s sole aim will be to provoke Americans and its allies against Islamabad which is challenging Indian hegemony in the region. Thus, Indian RAW could create a dangerous misunderstanding in which the US could use small nuclear weapons against Pakistan or could ask the latter of rollback its atomic programme. Undoubtedly, in such an environment, considering India qualified for acquiring of nuclear technology through “global powers” led NSG and IAEA and obstructing Pakistan’s safe nuclear energy programme is discriminatory as well as an effort to hinder peace and economic progress of Pakistan. And hazardous materials in nuclear facilities patrolled by low morale CISF troops across India are also liable to be stolen by insiders having grievances against employers and typical Hindu mindset of Indian leadership. Indian sponsored ISIS elements could use these stolen materials. Washington and its other allies, instead of pressing India for quick nuclear reforms are encouraging India to expand its nuclear stockpiles. The US-led West need to take cognisance of such ventures rather than criticising Pak-China civil nuclear cooperation. In light of these adverse developments, we can conclude that Indian insecure nuclear programme is threatening regional and global peace. Therefore, the world’s various forums such as EU and UNO, including Russia should also take cognisance of New Delhi in this regard. Nuclear power plants are designed to withstand natural disasters like earthquakes. In France, for instance, nuclear plants are designed to withstand an earthquake twice as strong as that experienced in the past 1,000 years. In India, the Kakrapar Atomic Power Station, Rajasthan Atomic Power Station, Tarapur Atomic Power Station and Narora Atomic Power Station operated safely when earthquakes of lower intensity were felt. The plants, however, could not withstand a tsunami. The campus of Kalpakkam Atomic Reprocessing Plant was flooded when the tsunami hit Tamil Nadu’s coast in 2004. 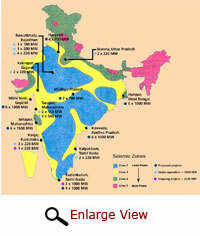 In India, every region falls in the seismic zone in some way, said Durgesh Rai of IIT Kanpur. “Most of our nuclear plants are in weak seismic zones but lie in coastal areas. Their structure is earthquake-resistant but they have not been tested against tsunami. The entire coastal region is believed to be vulnerable to tsunami,” he said. Nuclear plants are built near the sea because sea water is required to cool the reactor. The power plant survived the earthquake and was shut down. Limits are set on the levels of velocity, acceleration and displacement in every power plant. The plant stopped functioning when the limits exceeded. The atomic reaction thus stopped. When the plant stopped functioning, seawater used to cool the reactor stopped flowing. The diesel generators that were to feed water to the power plant also apparently shut down. Thus, the cores began to heat up. Though the fission of radioactive elements was stopped, some reactions continued generating a great deal of heat. Without cooling, the temperature rose, boiling off the remaining water and increasing pressure leading to an explosion. In 1995, the Kobe-Osaka earthquake did not affect the nuclear power plant just 110 km from Kobe. After the 7.2 magnitude earthquake, a panel was set up to review the safety of nuclear facilities in Japan and design guidelines for their construction. The Japanese Nuclear Safety Commission (NSC) approved the panel’s report. After recalculating the seismic design criteria required for a nuclear power plant to survive near the epicentre of an earthquake of high intensity, the NSC concluded that under current guidelines the plant could survive a 7.75 magnitude quake. Earthquake-prone regions are categorised between Zones I and IX from least earthquake-prone to most earthquake-prone. 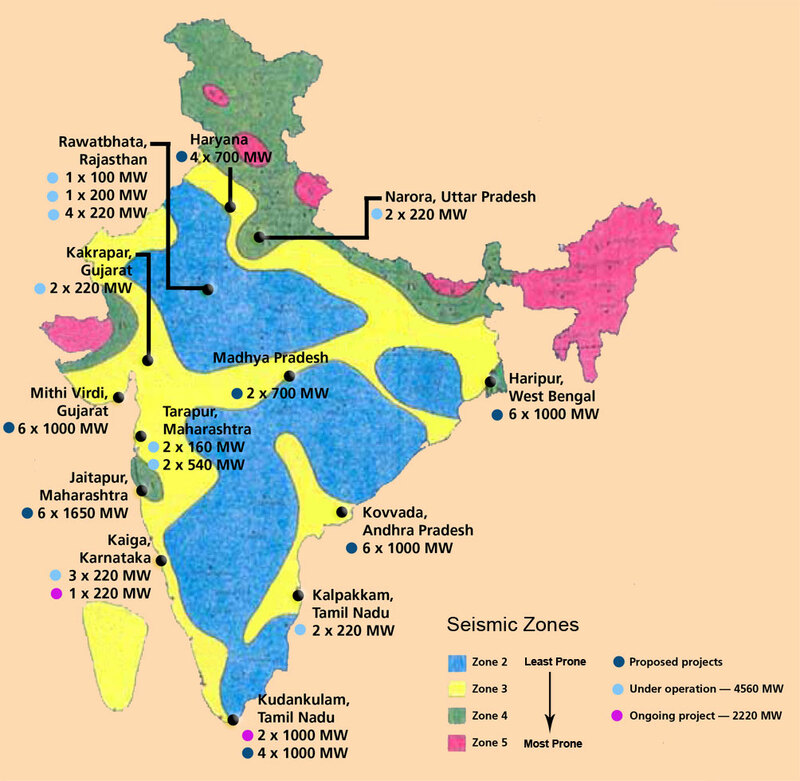 Indian nuclear power plants are situated in Zone II and III except the Narora plant in Uttar Pradesh, which is situated in Zone IV. Japan’s nuclear plants are in Zones VII, VIII and IX.